Join us in urging the U.S. government to improve Americans' health by signing this petition asking USDA to remove the dairy group from MyPlate - Tell USDA: MyPlate Is Making Americans Sick. Pushing milk, flavored or not, on children is wrong. Milk and other dairy products are the No. 1 source of artery-clogging saturated fat in the American diet, contributing to heart disease, type 2 diabetes and Alzheimer’s disease. Studies have also linked dairy products to an increased risk of breast, ovarian and prostate cancers. The National Institutes of Health estimates that 30 to 50 million American adults are lactose intolerant, including 95 percent of Asian Americans and 60-80 percent of African Americans. In spite of that, the government actively subsidizes milk production, keeping prices low so that Americans will continue to consume it. When students returned to Los Angeles public schools this fall, for the first time in five years, chocolate milk was back on the menu. No one would argue that a carton of chocolate milk—full of cholesterol, saturated fat and more sugar than two Krispy Kreme doughnuts combined—is healthy. So why has it made its way back onto the lunch line, and what can you do about it? School board members argued that without the sugary chocolate and strawberry flavors enticing them, students were “at risk” of drinking less milk. By returning chocolate milk to the menu, LAUSD calculated that milk consumption could increase by 4,332 gallons a week. That’s a big win for the dairy industry—and a big loss for students. Some might assume that milk’s calcium content is essential for children to grow strong bones. Not according to the science. A 2012 study published by the American Medical Association showed that children who consume the largest quantities of dairy products have at least as many bones break as those who consume less milk. Among the most active girls, those who consumed more dairy and calcium actually experienced more stress fractures compared with those who consumed less. Similarly, another study found that the more milk teenagers consumed, the more bone fractures they later experienced as adults. Calcium is important, but it’s readily available in more healthful foods like green leafy vegetables, beans and whole grains. Dairy also devastates the environment. In drought-ravaged California, we should support students who choose to ditch the dairy. 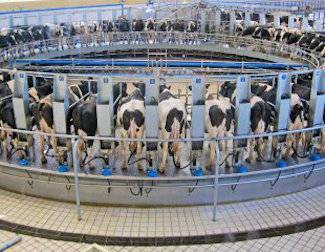 Producing just a single gallon of milk requires 880 gallons of water. That’s nearly 55 gallons per cup. On top of that, animal agriculture is a leading cause of climate change, emitting more greenhouse gases than all forms of transportation combined. Industrial dairy cows suffer a life filled with illness, with one out of every 10 cows in a herd prematurely dying every year. Given natural conditions like healthy food and outdoor exercise, cows have an average lifespan of 20 years. But shot full of antibiotics and hormones to overproduce milk, and committed to a life of 24-hour confinement, they are spent before they reach the age of six, killed and processed for their meat. So if it’s not healthy for us, the animals or the environment, why does the government continue to require that public schools offer milk with every meal, even when student demand is down? Follow the milk money. Schools account for about 7 to 8 percent of all milk sales. Knowing it’s a must-win market, the dairy industry uses its money and lobbying power to convince us that milk is an essential part of children’s diets. And it works. During the 2013-2014 school year, the USDA spent more than $20 million taxpayer dollars on dairy product subsidies that went into school lunches and other child nutrition programs. It’s not the first time the government has propped up the milk industry at the expense of Americans’ health. Take MyPlate, the USDA’s plate-shaped guide to healthy eating, consists of vegetables, fruits, protein, and grains accompanied by a smaller circle representing dairy. The National Institutes of Health estimates that 30 to 50 million American adults are lactose intolerant, including 95 percent of Asian Americans and 60-80 percent of African Americans. In spite of that, the government actively subsidizes milk production, keeping prices low so that Americans will continue to consume it. Between 1995 and 2009, the dairy industry received nearly $5 billion in government subsidies. The government also protects dairy producers from natural price declines when demand is down by purchasing surplus milk and cheese. Just last year, with dairy industry sales sagging and billions of pounds of unwanted cheese piling up, the USDA stepped in and purchased 11 million pounds of the excess cheese at a cost of $20 million. The USDA also manages a dairy "checkoff" program, which collects funds from milk producers and then funnels them into campaigns to promote dairy products—like the ubiquitous “Got Milk?” ads from the 1990s. And though the federal government urges Americans to limit their fast-food consumption, dairy checkoffs work with these same fast-food restaurants to develop new products that maximize the milk. The checkoff program helped develop and promote products like Wendy’s Cheddar-Lover’s Bacon Cheeseburger, Taco Bell’s Cantina Double Steak Quesadillas and Pizza Hut’s Ultimate Cheese Pizza. Dairy checkoff funds are also used for nutrition education. That mostly means targeting elementary and middle school in an effort to turn them into customers for life. In fact, a checkoff-funded program called “Raise Your Hand for Chocolate Milk” initially used its half-million to a million dollar budget to raise alarm about children drinking less milk to convince schools to keep chocolate milk on the menu. It’s time to stop lining the pockets of the dairy industry at the expense of our children’s health. For all the government’s work to ensure that children are drinking more milk, where is the focus on ensuring that they eat enough fruits and vegetables—which actually do have protective effects against heart disease, diabetes and other chronic conditions? Most American children get only about a serving of vegetables and a serving of fruit per day, which are squeezed into their lunches by counting pizza and French fries as vegetables. With demand for dairy down by about 40 percent since 1970, the government should stop supporting a dying industry that’s making Americans sick. Until that changes, part of the solution lies with us and the choices we make with our own money. Fortunately, more and more consumers are demanding healthful, non-dairy options, with soy milk, almond milk, rice milk, and even pea milk starting to crowd out dairy milk on grocery store shelves. The non-dairy milk market is booming, with sales expected to grow by 16.6 percent—or $35 billion—by 2024. And half of Americans now report that they regularly opt for non-dairy milk. After 92 years in business, one of New York City’s oldest dairies welcomed the trend. With profits falling, Elmhurst Dairy closed its doors. But it soon reopened, selling only dairy-free plant milks. According to CEO Henry Schwartz, "After 92 years in business, it was time to embrace a new model and look toward the future." Susan Levin is a registered dietitian and director of nutrition education for the nonprofit Physicians Committee for Responsible Medicine. At the affiliated Barnard Medical Center, she counsels patients on disease prevention through healthy, plant-based eating.